Emerson began construction of a global data center on the campus of the company's St. Louis headquarters in early 2008. The data center supports the company's initiative to consolidate its global network—comprised of more than 100 data centers worldwide—into just four facilities, while leveraging innovative architectural and building designs and IT infrastructure technologies to optimize energy and operational efficiency. The facility's cutting-edge architectural design complements an efficient technology infrastructure to trigger energy savings of up to 31 percent over a traditional enterprise data center. The facility is fully equipped with a host of unique energy-saving attributes, including daylighting features, a reduced building footprint and one of the largest rooftop solar arrays used by a data center. These design and construction features were enhanced by internally-developed strategies addressing the three most critical constraints faced by data center managers today—power, cooling and space. To complete the project, Emerson enlisted an estimated 150 workers and leveraged the expertise of several design and construction partners, including Fox Architects, Musick Construction, Clive Samuels & Associates and Technology Site Planners. Principal construction on the 35,000 sq. ft., $50 million facility (including all Phase I equipment) was completed in July 2009. Achieving energy efficiency without impacting performance has been a longtime challenge for U.S. data centers. According to the Environmental Protection Agency, in 2006 the industry consumed nearly as much electricity as 5.8 million U.S. households. Without energy efficiency improvements, conventional data centers' energy consumption could nearly double in five years, driving unacceptable increases in energy and a corresponding rise in greenhouse gas emissions. With these facts in mind, Emerson began construction of a global data center on the campus of the company's St. Louis headquarters in early 2008. In addition to consolidating Emerson's global network, the project was intended to serve as an architectural reference point for sustainable data center design. Understanding the need to achieve specific sustainability and availability requirements dictated before construction even began, Emerson approached the project with the philosophy that the IT and facility design teams should be seamlessly integrated in addressing all aspects of the facility's design and construction. By taking this approach, it was ensured that performance requirements and operational benefits across would be weighed equally. This collaborative approach to the facility's design also enabled the design team to leverage its collective expertise to develop innovative solutions—such as the data center's roof-mounted condenser configuration—that may not have been otherwise realized. Emerson wanted to ensure the project would represent sustainable best practices, both during and after completion of principal construction. To meet this goal, Emerson would optimize the potential of an existing site on its St. Louis campus by triangulating the facility with existing assets, minimizing the project's required footprint. The use of locally-procured and recycled materials enabled Emerson to significantly minimize the use of fossil fuels and the diversion of the majority of the project's waste from landfills further minimized the project's environmental impact. Emerson also stressed the importance of leveraging the latest sustainable technologies to support the facility's infrastructure. Through the use of photovoltaic technology and natural daylighting for the entire facility, Emerson maximized the use of renewable energy without seriously impacting the facility's ROI. In addition, through the installation of efficient fixtures and implementing an environmentally friendly natural drainage system, Emerson was able to take extensive steps to protect and conserve water. The single-story facility is designed to ensure equal use of the building for all. In addition, expandable raised-floor space ensures the facility maintains flexibility for future expansion. Data centers, by default, are rarely lauded for their aesthetic appeal and have traditionally been characterized as "bunkers" that are primarily utilitarian in design. In designing the building interior, exterior and surrounding landscaping, Emerson paid special attention to reflecting the high-tech nuance of the surrounding campus while still recognizing that aesthetic design should support the nature of the building. 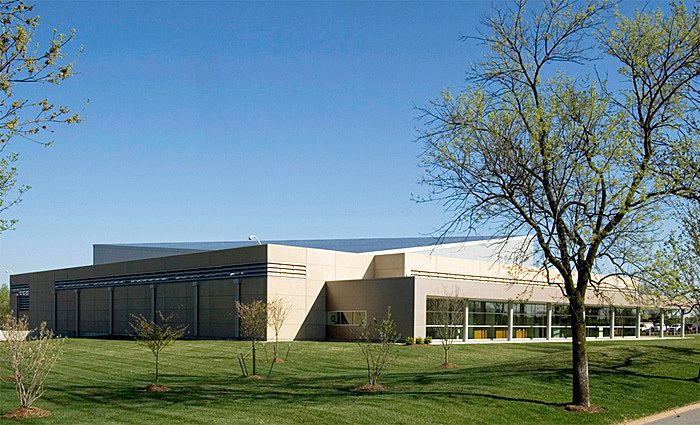 When considering post-consumer materials to make up the data center's structural framework, Emerson carefully selected cost-efficient building elements that offered the desired life-cycle payback without compromising the required strength and hardening qualities required for a mission-critical facility. In considering space needed to successfully support Emerson's global consolidation effort, the facility was designed to ensure scalable growth. Special attention was paid to anticipating changes in information technology (IT) and other building systems and equipment to ensure that infrastructure changes could be made down the road without an extensive "fork-lift" upgrade. Through the use of high-performance/redundant external glazing systems, the facility offers natural daylighting—a feature typically not found in enterprise data centers due to the structural vulnerabilities caused by external windows. The enhanced lighting is intended to improve employee efficiency and productivity, reduce human error and enhance employee recruitment and retention. Because it is a mission-critical facility designed to support an "always-on" global network, the data center was designed to withstand a variety of natural and man-made disaster scenarios, including earthquakes, telecom fiber cuts, tornadoes, flooding and fires. From a structural perspective, the data center is designed to withstand up to an F3 tornado or an earthquake up to 8.0 on the Richter scale. In addition, the glass used on the front of the building is rated to withstand hurricane-force winds. Three separate fire protection systems also were incorporated to provide protection in the event of an emergency, including a pre-action dry pipe, a traditional wet system and a clean chemical system. The project initially was projected to achieve a 17.5 percent reduction in energy consumption compared to conventional data centers. Based on the expectation, Emerson anticipated the project would achieve LEED Silver certification—becoming the first data center in the Midwest to earn the rigorous accreditation. However, thanks to additional anticipated innovation credits and an increased estimated energy savings of 31 percent at project completion, the facility was awarded LEED Gold certification in 2010. Emerson assembled a unique ownership group for its design and construction partners. Comprised of its own internal IT and facility management experts, the group was brought on for counsel at the project's inception and played a critical role in laying out a fundamental roadmap for the project, from initial construction to the rigorous data center provisioning process following the completion of the initial build. In selecting a site for the data center, Emerson chose an existing parking area on its campus to serve as the site of the project. Because of its triangulated configuration with other buildings on Emerson's campus, the site offered convenient access to electrical sub stations as well as water and fiber optic loops. Existing office space and parking also enabled Emerson to considerably condense the building's required footprint and preserve green space that otherwise may have been enveloped in the project. During the design process, Emerson faced several tradeoffs that ultimately would impact the facility's efficiency attributes. When analysis the site's existing topography and tree line eliminated the possibility of reliable wind power, Emerson decided upon a roof-mounted array. In addition to offering the best available concentration of natural light to generate 100kW of power, the data center's 7,800-square-foot rooftop solar array also minimizes the project's site footprint. When constructing a "green" data center, the IT building blocks inside the walls of the facility become a fundamental element in the building's overall design. To maximize efficiency without compromising reliability, Emerson implemented 10 prioritized best practices outlined in its Energy Logic roadmap intended to optimize energy use and minimize critical resource constraints. The roadmap was developed through extensive research and modeling of "the cascade effect"—which specifies that one Watt saved at the processor level can save an average total of 2.84 Watts in energy consumption. Emerson also took steps to maximize the project's overall sustainability during construction and long-term after completion. Emerson's construction partners sought materials that would be sustainable while still facilitating the greatest building life cycle payback. To meet these unique needs, the facility's frame was assembled from recycled steel procured and refined locally to minimize the energy required to transport it to the construction site. In whole, nearly 20 percent of materials used to assemble the building were comprised of post-consumer materials. In addition, 80 percent of waste resulting from the construction was diverted from landfills and locally recycled to further minimize project's carbon footprint. To further reduce the facility's impact on the surrounding environment, all impervious surfaces were designed to contribute to a natural drainage system that filters waste water before it reenters natural water sources. From the project's inception, the building's designers meticulously consulted U.S. Green Building Council guidelines for achieving a predetermined LEED certification. The designers also relied heavily on the use of building information modeling (BIM) software throughout the building's construction. In addition to providing three dimensional renderings of concepts and/or progress to the owners, contractors and subcontractors, the use of BIM also played a critical role in modeling the facility's supplemental cooling systems and server rack configuration. At its core, the data center offered 6,000 sq. ft. of available raised floor space—expandable up to 12,000 sq. ft. to accommodate up to 5,000 servers—and was designed to use only as much physical space as needed, while still allowing for easy expansion. The facility's IT infrastructure was comprised in large part of locally-available data center power, cooling, and monitoring technologies from Emerson Network Power, which enabled Emerson to achieve the necessary levels of efficiency and reliability without having to enlist an outside vendor. The facility's HVAC and lighting control systems were designed with a host of sustainable attributes. To enhance the efficiency of the HVAC systems, a Computational Fluid Dynamics (CFD) model was run to simulate space loads within the data center. Air devices then were located to ensure optimal system performance and a high performance environment for the equipment. The data center's intelligent lighting control system also accounts for both artificial lighting inside the facility and daylight available outside the facility. The lighting control system automatically reduces artificial lighting whenever sufficient daylight is available, further reducing the facility's electricity consumption. Overall site design for the data center also incorporated unique cost-reduction attributes, including a high-efficiency building envelope and water-efficient landscaping and fixtures. The facility features new building materials that direct natural daylight into the building's core, reducing power consumption. These materials, including hurricane-proof glass in the windows, maintain the building's structural integrity and make it strong enough to withstand an F-3 tornado. The natural daylighting also is expected to improve employee efficiency and productivity, reduce human error and enhance employee recruitment and retention. While Emerson set out on the construction of its data center with very specific sustainability goals, a synergy of energy efficient design and long-term ROI became increasingly evident throughout the construction process. After evaluating the costs and benefits of energy efficient strategies implemented, Emerson learned that every step taken toward sustainability and LEED certification was justified directly by the expedited ROI it ultimately would provide. From a project management perspective, there also were significant lessons learned with regard to the integration of internal/owner project teams and outside contractors. While the assembly of an integrated team represented one of the most positive aspects of the project, the procurement and bidding process unfortunately prevented the participation of several contracting parties, including electrical and mechanical personnel. Because of the owners' involvement in the technical aspects of the preliminary design process, many of these teams had to be brought on board after initial plans for the project already had been finalized and agreed upon, making the bidding process significantly more challenging for the contractors.